Maintenance script that shows some statistics on the blob_orphans table, created with trackBlobs.php. Definition at line 34 of file orphanStats.php. Definition at line 35 of file orphanStats.php. 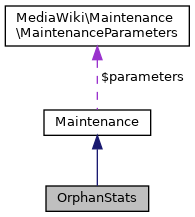 Definition at line 48 of file orphanStats.php. References $dbr, $hashes, $res, as, DB_REPLICA, Maintenance\fatalError(), getDB(), and Maintenance\output(). Definition at line 41 of file orphanStats.php.